I am privileged to be able to call myself Franco-Ontarian. Yup, that’s a thing. We have a flag and even an unofficial anthem. My father’s family has been living in Tiny Township, en français, for well over a hundred years. The school at County Road 6 and Concession 12 once had so many Lefaives attending it that they named the intersection after us. 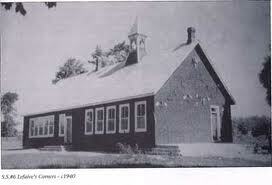 The school at Lefaive’s corner. That’s right, we have a whole corner. 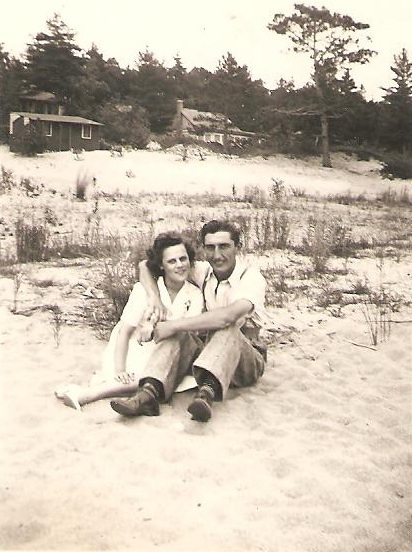 Mémère et Pépère, sur les plages de la Baie Georgienne. I’m proud of my heritage, weird idioms and all. I also applaud and support any effort to keep our language and culture strong. It’s hard work, but it’s important. Sometimes it feels like we are on a rickety french raft — or maybe a birch bark canoe? — in a sea of english, but we keep paddling. Now that I’m local, I’m looking forward to lending my slighlty wobbly paddling arm more often. At the centre of that canoeing (?) effort is one of my favourite events of the year, le Festival du Loup. Organized by local people, it takes place at the park in Lafontaine: the core of the french community. The festival was this past weekend, and I was delighted to be able to share it with my « France French » friend Sylvie. We volunteered Saturday morning, donning beautiful yellow smocks and fastening neon orange paper bracelets to people’s wrists at the entrance. 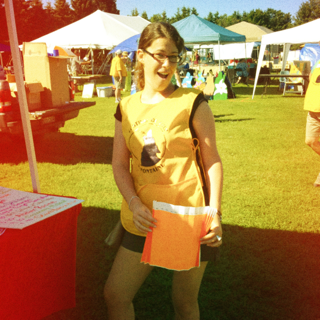 Sylvie, showing off the Festival du Loup volunteer smock. Minus a brief stint at the beach, we spent the afternoon and evening listening to live, french music. My cousins Kelly, Jill and Nicole performed as Ariko, my childhood crush and longtime friend Joël Forget played some of his original songs (one of them about me), and JF’s brother Damien Robitaille was the headliner. 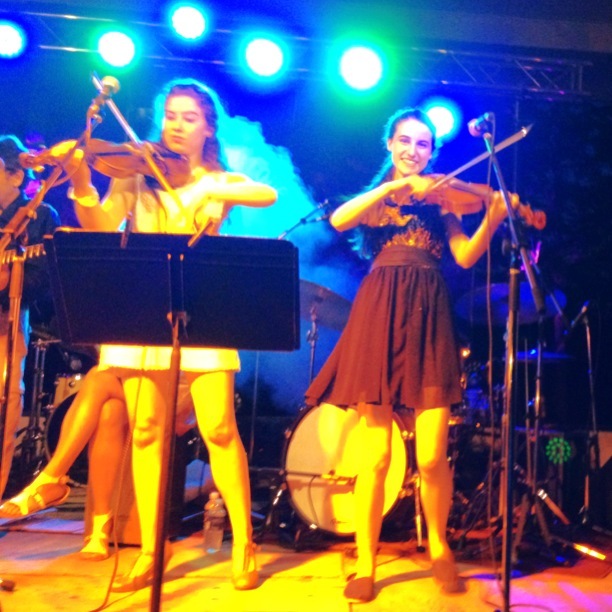 Mes cousines, Jill et Nicole Lefaive, en pleine performance. Why do I love this festival so much? Because, in the words of Larry Lalonde, it feels like a great, big family reunion. Folks I grew up with come in from out of town and hundreds of people of all ages living in and around Lafontaine make a point of being there. It’s a great opportunity to catch up on gossip, re-connect with friends, and just enjoy dancing at the heart of a community I know and love. This entry was posted in Community Events, Francophonie, Love, Family and Friends and tagged Damien Robitaille, Education, Festival du Loup, France, Franco-Ontarian, franco-ontarien, French, French language, Lafontaine, Larry Lalonde, Lefaive, Notre Place, Paul Demers, Tourtière by Mikaela Lefaive. Bookmark the permalink. Omg j’adore les photos! Awesome entry Mik. Love it! Go Lefaives!!!!! I love this entry – I share similar feelings being a Tibetan in North America and it is good to be reminded that there are many more people in the same boat – or in this case, the same birch bark raft! As for weird cultural idioms, try this one – “ngae nying gi tsilu” – literally translated as “the fat of my heart” and it means “my love”. I don’t know if they were trying to say love gives you a heart attack but there you have it.